This old Buddhist temple complex is active and is said to have a history of 1,500 years. 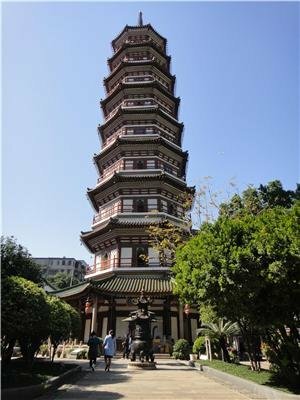 There is a tall pagoda that was rebuilt about the year 1900, and there is a main hall that often has Buddhist worshippers worshipping and burning incense. The Temple of the Six Banyan Trees (Liu Rong Si, 六榕寺) is an ancient temple that was originally built about the year 537 during the Liang Dynasty era. The Temple of the Six Banyan Trees was originally called the Baozhuangyan Temple, but a historically famous literati called Su Shi from the Song dynasty called it Liu Rong (Six Banyan Trees) because of six banyan trees that he saw there. Since then, it has been called the Temple of the Six Banyan Trees. A pagoda was built in 1097. It was rebuilt in 1373 after a fire. By the late middle 1800s, the pagoda that stood there was damaged and looked different from the one that is there now. It was rebuilt in 1900. Now it is an active Buddhist temple where people burn incense at the dates of the Chinese New Year and Lantern Festival. People stand in line to be the first to burn incense because they think this will bring them good luck. There are foreign consulates in the area, and foreign people who come to adopt infants sometimes stop in to get a blessing in front of the Kuan Yin. There are several buildings. Once through the main gate, the first hall one comes to is the Tianwang Hall that has a smiling Laughing Buddha. The Pagoda itself may be the main architectural attraction. It is nine floors high and is red and white. The roofs are painted red. The main hall called Daxiong Baodian Hall has three copper Buddha, which are Amitabha Buddha, Sakyamuni Buddha and another Buddha. 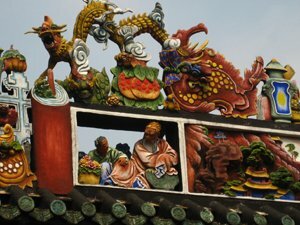 China Highlights can help you customize a tour to visit this temple, or just see our Guangzhou Tours. Address: 87 Six Banyan Tree (Liu Rong) Street, Yuexiu District, Guangzhou City. You can show the address to a driver. Bus: Take bus 12 or 215 to Liurong Road Station or 74, 85, 88, 102, 104 and others to Zhongshan Liulu Station. Train: Going by Guangzhou Metro is convenient because Line 1 and Line 2 both go next to it. So you can come to it from multiple directions. If you take Line 2, go to Gongyuanqian Station and take Exit B. It you take Line 1, get off at the Gongyuanqian Station. Line 1 connects with the fast train from Shenzhen at the Guangzhou East Station. Line 2 passes close to the Main Guangzhou Train Station. Go to see most famous Chinese temples.